Lead with clip and ring (in handle). Ring is used for halving lead size - ideal for roadside use and greater control. Hand spliced from top quality marine rope - soft and easy on your hands. Light, strong, durable and washable, this lead can be rolled up and put in your pocket. 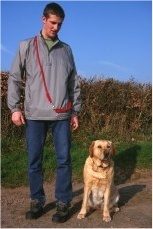 The 10mm 1.7m length clip lead can be carried diagonally across your shoulder leaving your hands free. Available in red black or natural.